Great carpet, though the colors seem a bit more vibrate online then once delivered. Loads of shedding initially but regular vacumming has improved. 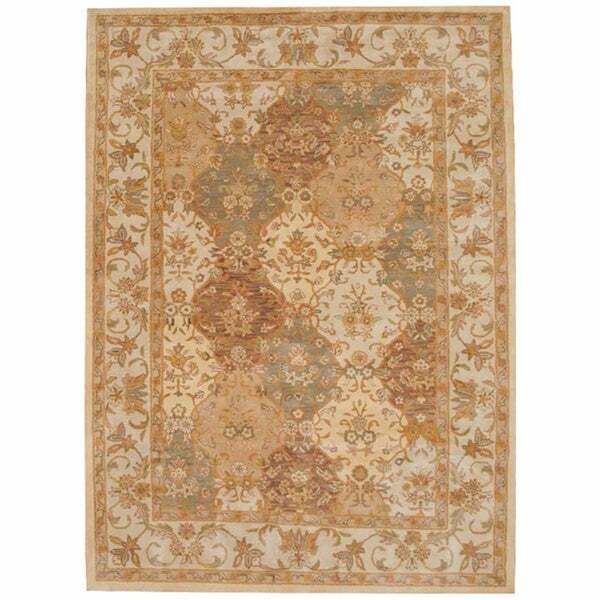 This rug is a unique piece of world art that will enhance your living space. All washing, spinning and dyeing of the wool are done by highly-skilled Bhadohi village weavers in the Varanasi region of India. The weaving technique is hand-tufted, which is a rug making process where weavers insert yarn into the rug backing with a hand held tufting gun to push and pull the threads through a pre-woven grid foundation. In a tufted rug, the tops of the loops are sheared to expose the ends of the threads for a softer, plusher pile. The knot count for this rug is 100. This rug is 100-percent hand-spun wool. The pile height is 0.5 inches. Dimensions 8 ft. 3 in. x 11 ft. This rug was purchased for a conference center at a law firm. The rug was chosen because of the color. I was surprised that the photo depicted the colors accurately and the quality was excellent. I wasn't sure if we would keep it, but everyone loved the warmth and subtle colors.I would recommend this rug if you are looking for quality and overall appearance. I had to replace all the carpets within our home due to a flood. In lieu of full carpeting I choose to have wood flooring and selected rugs. I picked this rug for my formal dinning room. I was a little aprehensive as to the color, quality, etc. in ordering on line. The pictures shown in the "lookup" were very close as to the true color, which to anyone is the prime reason for selecting a rug for your home. I am well pleased with the purchase. The colors of the rug are very subdued, but add enough color so that accent colors can be pulled from the rug. The rug is very rich looking. The only drawback I have found thus far, is that it loses fibers like crazy. I assume over time, this will stop. Very pretty rugs. Using in my formal living room. Colors as described. Loved the rug. Picture was very accurate regarding colors. Looks great in Living room. In real life this rug is very, very pale in color. It does not even resemble the picture shown. The product is very good. The delivery was quick. I am very pleased with the price. It was exactly what I needed and the product qualified. Thanks. A little too thick for us. Will spend more money to get the hand-knotted one in the future. Beautiful...we love the look in our living room. HOWEVER, we are having problems with a musty odor. Working with customer service to resolve, but won't be able to keep it if we can't resolve the smell issue as it triggers my allergies. "Please, can someone tell me the colors in rug? Is that more of a subtle blue or green? My walls are sage green so I'm looking for something to go with that . Definitely do not want any blue. Thank you!" The colors are green, red, yellow, gold and brown, in our opinion.Color is open to interpretation. Please remember, due to the difference of monitor colors, the colors on some of our items may vary slightly. Thank you. I spent quite a bit of time looking for 2 new wool rugs. I checked for size and also color, which was very important. I read the references of those that had previously purchased this rug. All of these points went into my decision making. I hope that I shall be pleased with this purchase.